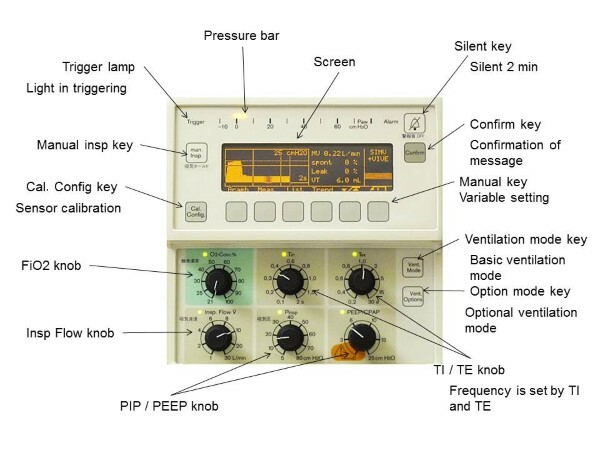 The control panel in the front is shown in Figure 1. The dials which can be adjusted for current selected ventilation mode are indicated by LEDs above each dials. 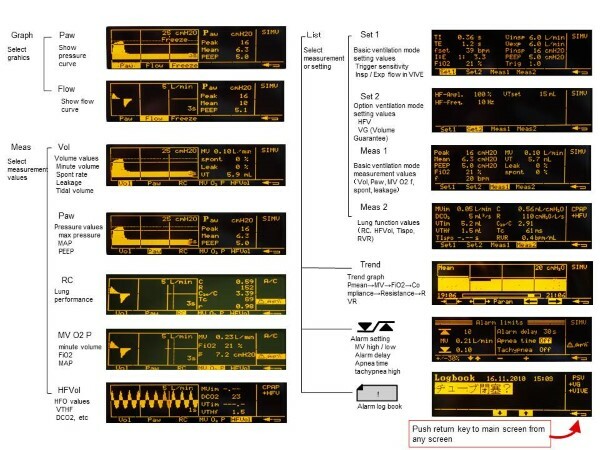 The liquid crystal screen (Figure 2) displays the status in graphic, measured values or ventilation mode. The graphic display can be selected either the pressure curve or flow curve. The graphic scales are set automatically. The measured values can be selected by “Meas” key. Usually, “Vol” is selected during conventional ventilation mode and “HFVol” is selected during HFV mode in most cases. Lists of items are sorted into either “Set” or “Meas” group. To set configurations, “Set1” should be displayed generally (Figure 3). “VT (Tidal Volume)” shows a tidal volume during expiration, “f” shows the number of detected spontaneous breathings, and “TIspo” shows actual measured value of inspiratory time. “RVR (Rate-Volume Ratio, RVR=f / VT)” in “Meas2” is the ratio of the breathing rate to the tidal volume. RVR drops when the tidal volume is stabilized and the patient status is ready for an extubation. This is one of the weaning index from ventilators2) . Though the display size of this device is small, it contains a number of screens. The user can return to the main manu by pressing “Return key” at the right corner. The LEDs on setting dials flash when there is a restriction with the setting like inspiratory time during PSV mode, or when the setting value needs to be confirmed. Babylog 8000plus doesn’t include the battery. The device stops and re-starts even if there is a short blackout, and the ventilation is stopped during that period. The permanent power supply is recommended for the operation of this device. Babylog 8000plus offers CPAP, IMV, SIMV, A/C, PSV modes. To access settings, press the key “Vent. 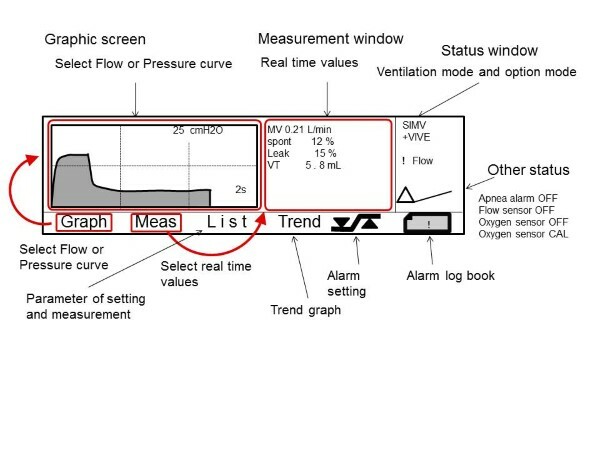 Mode”, select the desired ventilation mode and press “on” in next screen to confirm the setting (Figure 4-a). 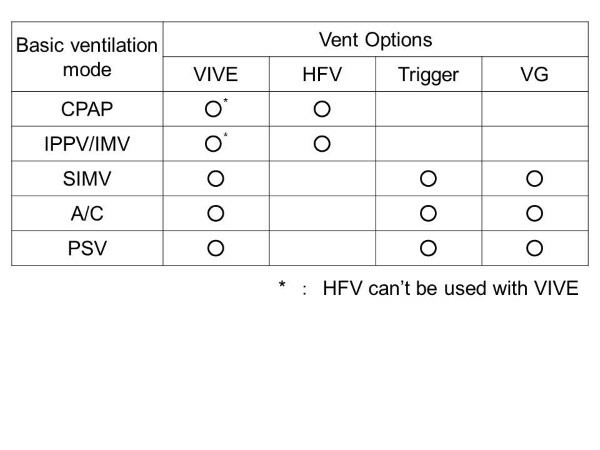 The table 2 shows possible combinations of the basic ventilation modes and options. VIVE (Variable Inspiratory and Variable Expiratory Flow) can be active in all ventilation modes; however, it will be deactivated when HFV is on. HFV is available during CPAP and IMV mode. 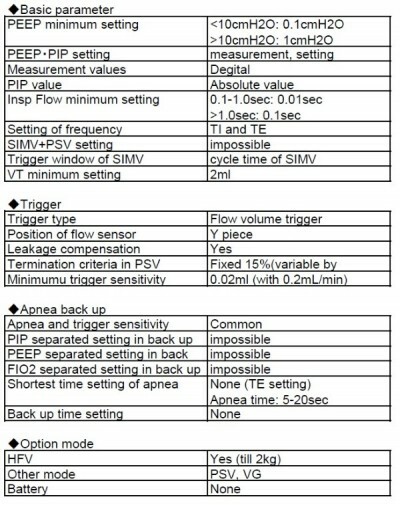 Inspiratory trigger can be activated during SIMV, A/C and PSV mode, and VG is also available during those ventilation modes. More details of these options will be described in next time . The patient breathing during PSV mode, is triggered not only during inspiration but also during expiration for the termination. The triggering changes according to the patient lung status. When the patient becomes apnea, Inspiratory trigger is not activated, but expiratory termination is activated. This function can be observed with a test lung. Set inspiratory time longer, and you can observe the status in the actual inspiratory time displayed in “TIspo” (“List”→”Meas2” left below). The pressure sensor of Babylog 8000plus is not placed at the Y-piece, the pressure is measured in the device. Because the diameter of cannula for Kawaguchi’s nasalCPAP is too thin, it may cause higher resistance and a pressure difference within the cannula, Kawaguchi’s nasal CPAP is not appropriate for this device. 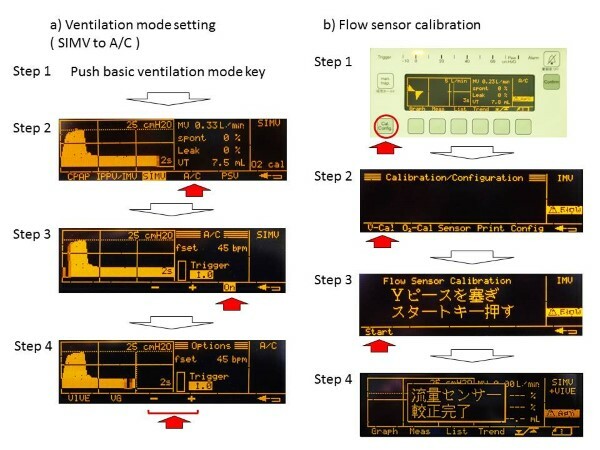 Calibration of the flow sensor must be done whenever the device is switched on. Press the key “Cal.Config” at the bottom left of the front panel to open “Calibration／Configuration” screen. Press “V-Cal” at the left bottom, a message “Seal the Y-pieace and press Start” will be displayed. Follow the instruction so that the calibration will be completed. The O2 calibration can be done in the same screen. However, O2 calibration is pre-set to be carried out automatically every start-up and every 11:00AM. The manual calibration is required only when O2 cell is replaced. The O2 cell needs to be replaced approximately every 12 months (may differ depends on the frequency of usage). O2 cell is in a nitrogen-sealed package, and it is required approximately 15-30 minutes after opening package. As it was described in the report of Bear Cub 750 PSV, inspiratory time can be adjusted by triggering the expiratory termination during PSV mode in addition to inspiratory triggerings. 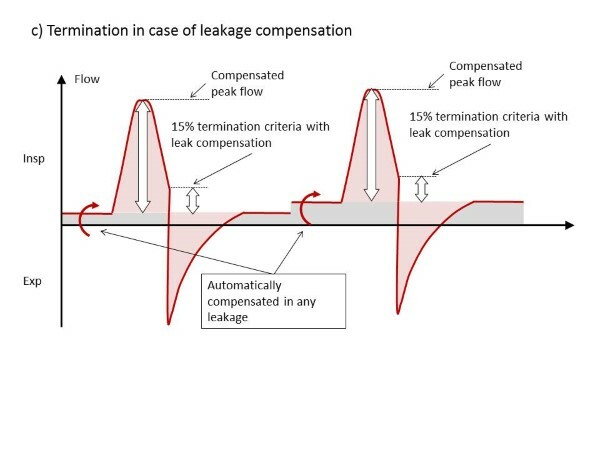 Termination criteria of Babylog 8000plus is fixed as 15% of the peak flow (Figure 5-a). Because the tube without a cuff is used for neonatal patients, we need to deal with leakage even during PSV mode. 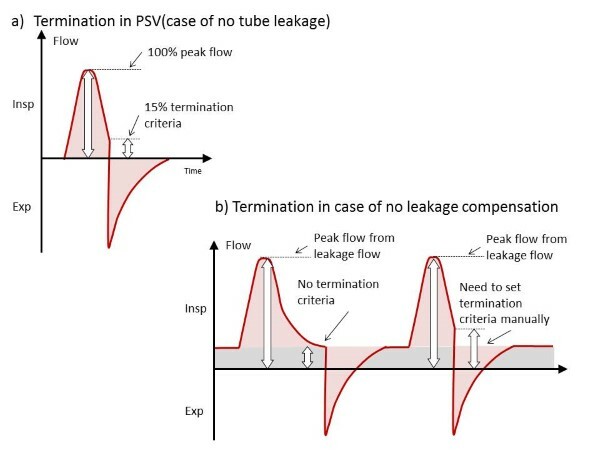 Generally speaking, PSV mode without automatic leakage compensation requires adjusting the termination sensitivity according to the leakage rate, because the patient breathing wouldn’t be terminated once the leakage exceeds the termination sensitivity against the peak flow (Figure 5-b). On the other hand, automatic leakage compensation of Babylog 8000plus compensates changes in the leakage rate. 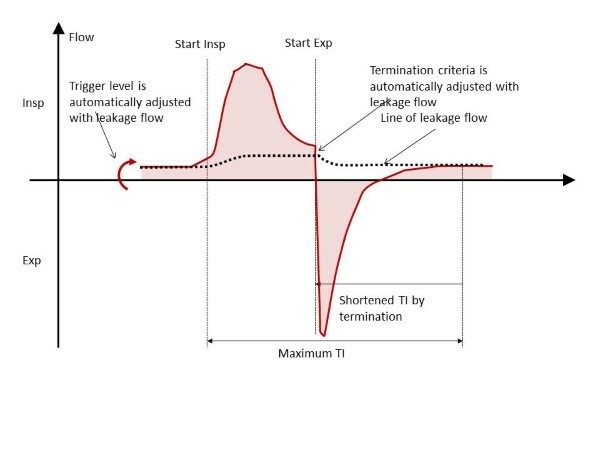 For Babylog triggers the termination at 15% of 100% peak flow from the compensated flow base line, there is no need to adjust the termination sensitivity manually though it is fixed at 15% (Figure 5-c). In addition to that, the automatic leak compensation is activated during inspiratory triggerings. The user does not need to pay extra attentions to the leak rate (if it is up to app. 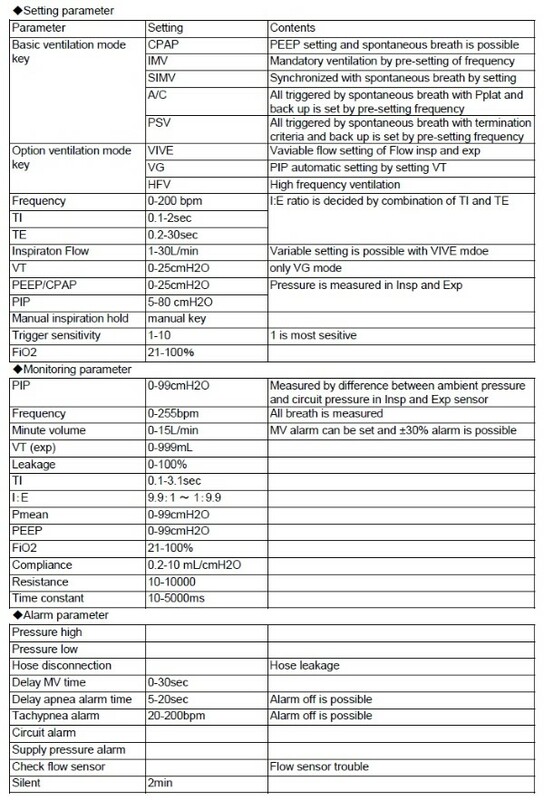 40%2)) during both inspiratory and expiratory phrases in PSV mode (Figure 6). Inspiratory triggering of Babylog 8000plus is based on the flow-volume triggering, and it is adjustable with a range of level 1 (0.02 ml) to 10(3 ml) 2). The flow-volume trigger can be activated if it detects an inspiratory flow bigger than 0.2ml/min and starts the measurement of volume. Because of the automatic leak compensation, this trigger is exactly “trigger sensitivity”, not intended to compensate leakages. For extremely-low-birth weight babies, I set the trigger level as “the most sensitive” if there is no condensation in the circuit.